April Demers and her students: AJ Sargent, Tai Lam, Hagan Stephenson, Allie Ferrari, Maggie Stephenson and Bridget Stephenson. EUGENE — O’Hara School pre-kindergarten teacher April Demers has been recognized by the National Catholic Educational Association as a Distinguished Teacher in Catholic Education. Demers, a teacher at O’Hara for 22 years, was one of 10 educators selected nationwide for the award. NCEA is the largest private professional organization in the world, representing 150,000 Catholic educators serving 6 million students in Catholic elementary and secondary schools. Demers will be honored at the annual NCEA Conference in April. The conference is attended by thousands of educators and administrators from across the nation and is the largest private-education gathering in the United States. A native of Eugene, Demers is a parishioner at St. Mary Church, which is a mile from the school. 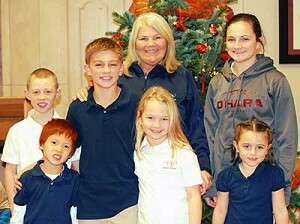 She and her husband Jeff have three children, all of whom attended O’Hara.